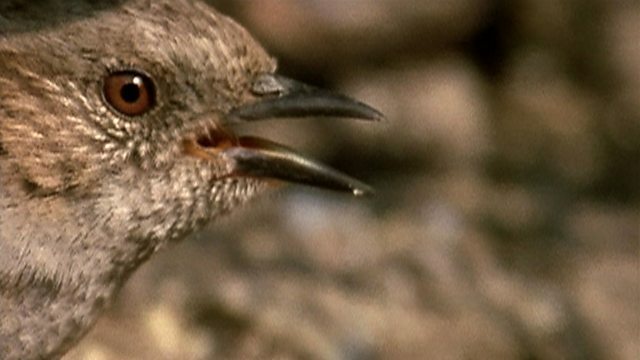 BBC Four - The Life of Birds, Finding Partners, Devoted dunnocks? With most bird species, both parents are needed to bring up the young, so most birds stay together after mating, at least until after the breeding season. Even so, there is still a little infidelity now and then. But perhaps the most bizarre behaviour of all takes place in the suburban gardens of England. The female hedge sparrow or dunnock is not as faithful as she might be. When her main suitor is distracted, the female sneaks off to quickly mate with another, twirling her tail to encourage him. Then she comes back and twirls her tail at her main suitor. To ensure his paternity, he takes precautions and pecks at her genital opening to make her expel his rival's sperm. He will persist at this for up to two minutes, until all his rival's sperm has gone. Then he mates with her so that his sperm fertilizes her eggs. But she has kept two males happy, both of whom will help to feed her young. Weka Territory—To Fly or Not to Fly? Feet on the ground—To Fly or Not to Fly?